The Acer liquid S2 smartphone is powered by 2.2 GHz quad-core processor with 2 GB of RAM and 16 GB of ROM. The phone installed Android 4.2.2 Jelly Bean operating system. 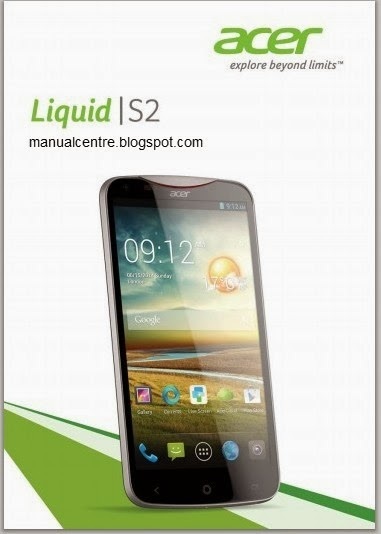 For owner of this phone, you can download the Acer liquid S2 Manual in pdf format from acer.com. The manual contains important information for example about settings guide and troubleshooting. The Acer liquid S2 User Manual consist of 69 pages with file size of 6.5 MB. It's available in english language. In the Acer liquid S2 user guide provide detail reference information such as Setting up phone, Unpacking your smartphone, Getting to know your smartphone, Charging the battery, Inserting the microSD card, Inserting the SIM card, Locking your smartphone, Navigating through menus and options, Using the touchscreen, using contacts, using internet calls and using messages. Then in the Acer liquid S2 owner's manual also provide information such as about browsing the internet, Setting up your Google email, using maps, AcerCloud setup for Windows, using camer for taking a photo, Shooting a video, using FM radio, Restoring to factory settings, Using a Bluetooth headset, Inserting a microSD Card, FAQ, troubleshooting, safety, and more.